Filed under Did I really do that? I thought I’d start this week off right by relaying news of my triathlon yesterday, since I’ve only been talking about it since April. Come to think of it, I’m gonna have to do some work on blog subject matter going forward. Maybe tomorrow I can talk about how I can barely walk and have tri-shorts tan lines. Anyway, the weekend was understandably tri-focused, and by the time my parents rolled in Saturday afternoon, I was feeling the worst case of nerves I’d ever felt. I was 100% sure I could not finish a triathlon. It was going to be hot. My legs are too short for this kind of thing. The list, it goes on. I spent all of dinner not eating anything (if you’ve met me, you realize the severity of the situation which comes with non-eating), went home, self medicated, and tried to get some sleep. When I woke up at 3:00 AM, I felt a little more sure. I was going to be able to do this, because once EH and CJ picked me up, I had no choice. We headed to our office, picked up our bikes, and rode down to the transition area, laying out our helmets and socks and sneakers and excess amounts of energy gel. I hate energy gel. I’d like to point that out. Especially when it’s been sitting in the sun for several hours and is warm. Sick. CJ and I watched JK and EH take off in their swim, and then waited around for our time to come, at 9:16. six hours after we’d gotten up. It was nerve shattering to watch everyone take off. I wanted it to be our turn. Finally, it was, and I sighted my parents, put on my cap and wetsuit (literally smacking a girl in the face by accident while doing it. She was nice though, and instead of hitting me back, she helped me with my wetsuit zipper), and dove into the water. A horn sounded. I didn’t have time to be nervous. I’d been training for 18 weeks, and I was ready. I took off. About three minutes later, there was a tri-tragedy. As people tried to swim over each other and get their bearings, someone’s arm got caught up in my chip. My timing chip, which gives you your official time and your status as a 2010 triathlon finisher. I felt it slide off my ankle, and grabbed as fast as I could, but the chip was gone. All that was left in my hand was the anklet. I knew in that moment that technically, my time in the tri didn’t count. My name wouldn’t show up as one of the finishers. I screamed in the water. I maybe cried a little. I thought about quitting. I’m competitive, I’ve been training for the better part of the year, and before I could even get .25 miles into the swim, none of it meant anything. But then I pulled myself together. Of course, you idiot, I thought to myself, this means something. It meant something to me, and regardless of who recognized my time as “official”, I was not leaving the race course until I crossed the finish line. I knew if I got out of the water, that would be far more disappointing than my time not being listed in the results. I thanked God that I paid so much attention to my watch, vowed to keep my time by that, and swam the rest of the mile clutching my now useless anklet. I got out the water after 36 minutes, far faster than any time I’d trained with. I was swimming on adrenaline and frustration fumes. In my transition run, I saw my parents and JW, and I shouted to them that my chip was gone. Their faces fell. I told them it was okay, and ran past. By that point, I had made peace with it. I wasn’t stopping. The rest of the race went well. Yesterday was hot, and aside from the fact that I ended my bike ride vastly dehydrated because I could not maneuver my water bottle out of its carrier without nearly killing myself, I felt okay. As I rode the nearly 25 miles, I noticed a lot of triathletes on the side of the road with broke down bikes to tend to. I tried to self motivate, telling myself that even though my time wouldn’t technically count, at least I’d cross the finish line, which was more than I could say for those bikers. I’d rather be me, I thought. And then I pedaled until I couldn’t feel my legs. My run took longer than I thought it would, but I’m taking into account that it was ninety degrees out. I spent as much time as I could in jogging position, although I doubt I was moving very fast. But that was okay. I was still moving. I poured all the water I could over my head and watched for mile markers. When I was about 200 yards out, I picked it up, and started to hear my friends and family. I crossed the finish line at 3:43:44, was handed a medal and a wet towel, and I was officially done. It didn’t matter to my family, who has counted me crazy for the past four months as I’ve told them about my training plan antics but told me they were proud of me anyway, and it didn’t matter to my friends, who could care less if it took me six days to cross the line. The point was, I did it. And you’ve got to feel good about that. So even if the Chicago Triathlon’s timing system comes up empty when you search for my name, I’m over it. But I’ll be back next year, with my chip super glued to my leg if necessary. 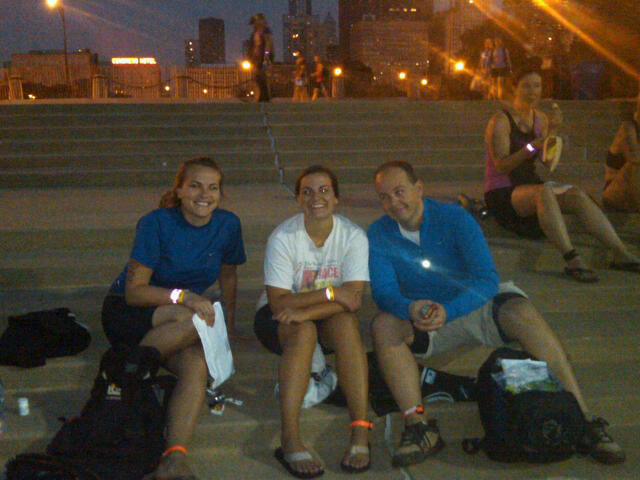 And that my friends, is the end of the 2010 Chicago Triathlon story. Morning kids. I’ve been up since three this morning, getting myself to the triathlon and hanging with my tri-team. Our transition is set up, we’ve taken pain killers, eaten some protein bars, and now all that’s left to do is listen to some hot beats and wait for our turn to come to hit the water. Someone remind me when I’m doing this again? The sun’s coming up finally, and I’m about three and a half hours from the start time. So wish me luck chickadees, I’ll probably need it. Big weekend coming up, and I’m ready for it. How was I supposed to turn that down, my friends? Aside from that giant, nerve wracking thing I’m doing on Sunday, I have parents headed this way tomorrow morning, packets to pick up, pesto to make a batch of (before the basil plant takes over the entirety of my deck), and a rugby game to attend. How is it rugby time again? I hope everyone else is as excited about the weekend as I am–I’ll be sending a debrief (provided I survive) on Monday. Have a good one, chicks! That term was coined by one of my tri-partner, EH, who proclaimed that after his ride to work this morning (where we’re storing our bikes until the race) he was shutting it down. Not working out until the triathlon. CJ and I decided to follow his lead. So in a half hour, I’ll be on my last leg of triathlon training. I’m mostly relieved, but a little worried. Maybe, but I don’t think, in the end, anything I could do now would help. So, I’m pedaling to work, resting my laurels until Sunday morning, and crossing my fingers. I know it’s the middle of the week, hump day, in fact, but I’m feeling pretty good. CJ and I took our last bike ride this morning, meeting so early that it felt more like a nighttime run, complete with a moonlit skyline to light our way. Delightful, except for the whipping wind on the way home, and the three thousand bugs I ingested. Nothing’s really perfect though, right? I was home earlier than I thought I’d be, so I’ve already taken in the Trib, eaten what really amounted to a bacon sandwich (JW looked horrified, I advised him to hold on through Sunday), and had a couple of mugs of hot coffee. Did I mention that it’s both cool and sunny in my neck of the woods? My neck of the concrete jungle, anyway. Also, although it will probably make you cry, I’m sharing this video this morning, originally shared with me through my Boston-based friend Katie. Does anyone else ever listen to Storycorps? They run here on Friday mornings, which inevitably leads to me weeping as I try to put on my makeup and pull myself together for work. But keep it up, NPR. Your stories are beautiful. Don’t let my blubbering get in the way. Now I’m off to finish getting ready, get myself to the office, and look forward to the opportunity to come straight home after work. It’s the simple things, my friends. What is that strange number, you ask? When it came in an e-mail, I got a little bit scared. But then, later that night, the far scarier information came. It consisted of tips for the week before the race, course maps, and most nerve wracking of all, my wave number and time. Starting time is 9:16 on Sunday morning, friends. Which means that post setting up my transition area, I’ll have several hours to sit around and think about all the things that can potentially go wrong. The list is long, chicks. If I had my way, I’d be starting as early as possible. If I had my way, I would have eaten a bagel and gotten up at 8:00 this morning, instead of running four miles before 7:00. This triathlon really prefers not to do things “my way”. I’m going to have to make peace with that. In any case, four miles went down pretty smoothly this morning, and tonight, I’ve got one last 1-miler in the lake. This thing is getting too close for comfort. But this never was about comfort, was it? Have a good Tuesday, kids.